Four video sessions of empowering insights into our true potential as we age. People over the age of 100, or centenarians, make up the fastest-growing segment of the US population. Many live active lives, free from major illness or cognitive difficulty. 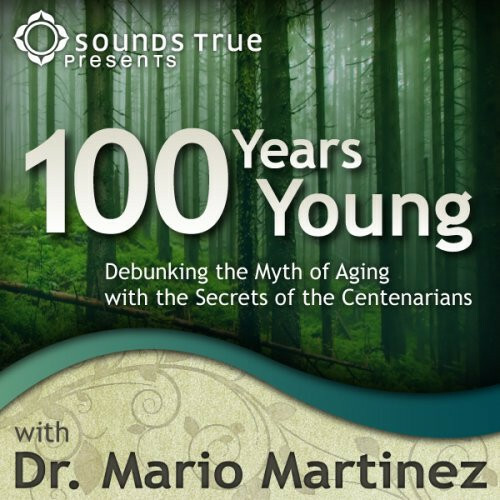 As Dr. Mario Martinez learned through his study of dozens of centenarians, good genetics and healthy lifestyle are not necessary the formula for wellness and longevity. But if that's the case, what is the secret to thriving well into our 80s, 90s, and longer? A radically new perspective on aging! Dr. Martinez discovered that it is the cultural portals we embrace—or our beliefs about youth, middle age, retirement, and senior citizenship—that have the greatest influence on the state of health we will experience as we grow old. 100 Years Young invites you to four self-paced video sessions with this pioneering neuropsychologist as he unveils research from the fields of biocognition, cultural epidemiology, and neuroscience that shatters conventional wisdom regarding longevity. Dr. Martinez discusses how these breakthrough findings can be applied to our lives today and as we age. How to identify fear-based misconceptions about aging and replace them with "centenarian consciousness"
Very informative and exciting information to transform our understanding of the aging process. It is changing my experience already. I did like the program a lot, found it useful, and will probably get The Mind-Body Codeas well. The only reasons for giving this program 4 stars rather than 5, are that there was a lot of repetition between sessions, and that Dr. Martinez alleges that "there are no vegan centenarians." A quick Google search disputes this, and at any rate, it's a statement that can't possibly be proven. I got the overall point -- that it isn't a specific diet that matters -- but Dr. Martinez lost some credibility by claiming that his conclusions are based on science, yet making an unprovable assertion. Dr. Martinez is one of those rare teachers who has ability to communicate radically new levels of thought in language that is both accessible and stirring. Here is a course of study that seamlessly joins the key forces that fashion human thought, reaction and health. I’m looking forward to participating in this online course and grateful that Dr. Martinez is tech-savvy enough to make it so easily accessible. I revisit my copy of The Mind-Body Code regularly and look forward to integrating this new course material into what I’ve learned from it.